AIP is a vibrant platform where independent and signed artists can further their career by raising capital and sharing revenue with music fans and other investors. All who invest are motivated to promote that song they’ve funded, as they earn from revenue that song generates. This together with our consensus-based New Share Offering (NSO) model means the funding crowd is a crucial part of the AIP platform. In ways, those who provide capital in exchange for royalty shares are the artists' partners. So we created an ambassador feature that further encourages these funding partners to invite their circle of friends, family, and influencers to join. How does the ambassador system work? 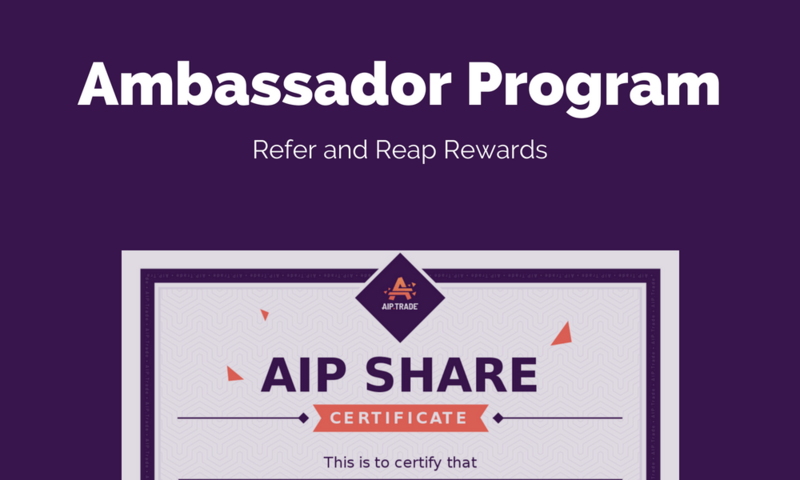 The AIP Ambassador System is an easy-to-use referral tool that incentivizes the AIP community to find like-minded contacts to join in supporting an issuer's (i.e. the musician's) NSO or song investment. 1. Any registered AIP member can invite others to join by using their ambassador link generated by AIP. 2. That link can be shared with your contacts via social media, email, or messaging apps like Facebook, WhatsApp, WeChat, etc. The link discretely contains a code that will automatically identify who generated and referred it. 3. In the event the referred person (who received the recommendation) follows the link to AIP and successfully signs up for the platform, they will both be awarded with AIP credits. It's free to register. 4. During this introductory phase for AIP, the referrer will get credited US$2.00, and the referred will get US$5.00 that they can use to purchase shares at AIP. Spread the love! Where can I find the ambassador feature? In AIP's Explore view, you can click on the image or title of any song listing to be brought to its Overview page. When at the Overview page, you'll see a Refer A Friend button towards the top of the card, to the right of the song image. Click Refer A Friend and you'll open a window with the referral link. You can copy the link to paste and share elsewhere, or you can select options under the link that will share directly via email or other social media and messaging apps. Now you can go to your social media channels, messaging apps, blogs, etc. to distribute the link to others. You can drop the link on screen by right-clicking in the desired location and selecting "Paste". Alternatively, you can also paste by pressing the “Ctrl” + “V” keys on your keyboard simultaneously if using Windows, or "⌘" + "V" keys on Mac. 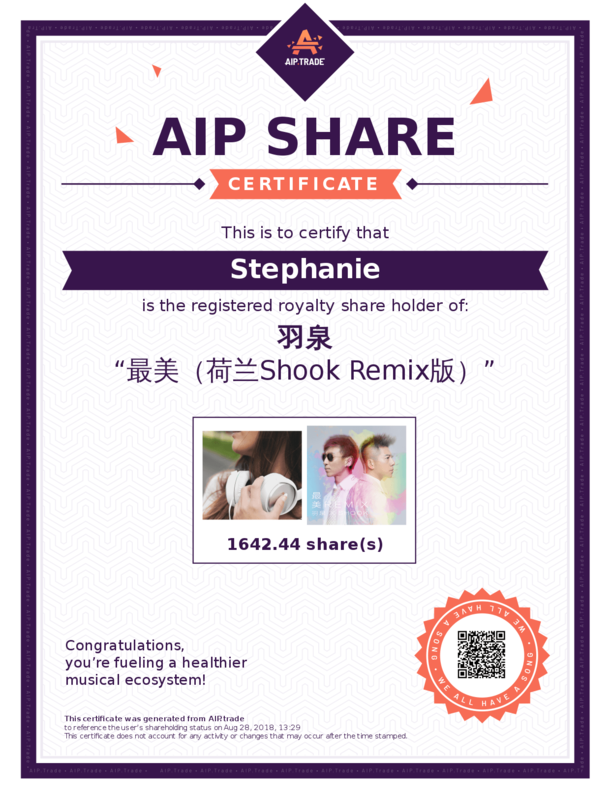 In addition to the above method, registered members can also refer songs they have funded via the QR code included in their Share Certificate. To do this, the referrer can go to their Dashboard page, click on “Get my certificate” located in the song listing, and a copy of the certificate will be generated. The QR code is at the bottom right of the certificate, and it has built-in ambassador tracking.